Does your APM tell you enough about your customers? The release of Foglight Application Performance Monitoring 5.9 from Dell has put the growing APM industry into the spotlight again. 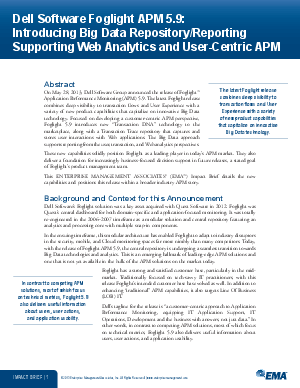 In contrast to competing APM solutions, most of which focus on technical metrics, Foglight 5.9 delivers detailed information about users, user actions and application usability. With new features such as “Transaction DNA” technology and a multi-dimensional user experience, Dell has positioned the transaction as the primary point of interaction and visibility. Learn the key benefits of this release, as well as how this new version fits into the overall APM story.